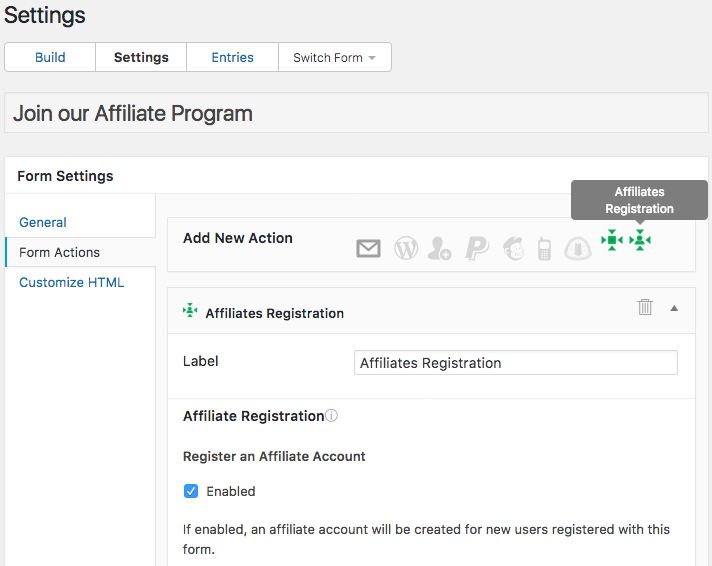 You can install the Affiliates Formidable plugin directly from your WordPress dashboard. This integration with Formidable Forms and Formidable Pro makes it very easy to create customized affiliate registration forms. It also allows to collect form data & track submissions by recording referrals for form submissions that have been referred by affiliates. This make it a great add-on to use for lead tracking, sales, support and many more uses that involve affiliates or partners referring visitors, customers and new members to your site. This extension integrates Formidable Forms and Formidable Pro with all our affiliate marketing plugins for WordPress – Affiliates, Affiliates Pro and Affiliates Enterprise. When used with our premium plugins, you will gain additional control over referrals, referral rates and other features. Allow affiliates to sign up through customized forms managed with Formidable Forms. To allow affiliates to register through a form, this extension provides the Affiliates Registration action that you can add to any form and configure as needed. The registration works seamlessly with any of our Affiliates plugins. You can customize the registration form using Formidable’s fields and review form submissions related to the affiliate accounts that are created through it. Allow affiliates to refer others to the site, record referrals to grant commissions on form submissions and gather leads. Our extension provides the Affiliates form action which can be added to any form. It can then be configured to grant fixed or variable commissions on form submissions. The applications of this integration range from simply recording and tracking form submission data to paying affiliated partners commissions on leads or successful purchases. 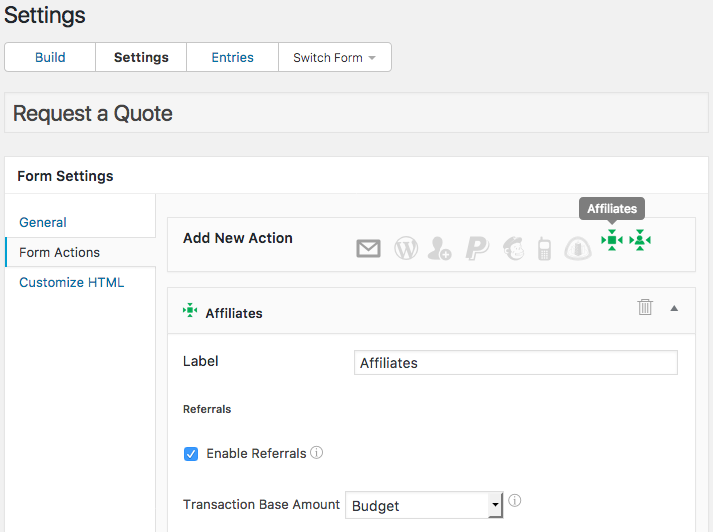 Clients can be traced back to the referring affiliate, team members can be notified when new form submissions have been received, thanks to the advanced integrated notifications features of Affiliates Pro and Affiliates Enterprise. Formidable forms are used to gather data which is stored in the form of referrals. Please refer to the documentation pages for setup and usage instructions. Submissions through one or more forms handled by Formidable Forms/Pro can generate referrals. This integration can generate referrals for all forms, restrict it to selected forms or exclude certain forms. 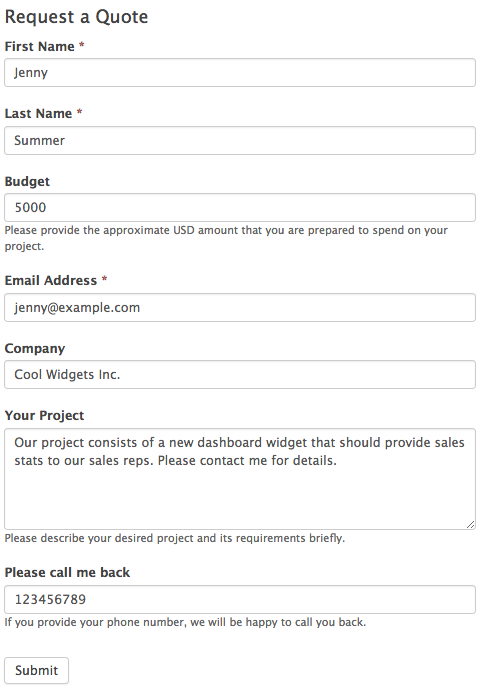 Formidable forms can generate referrals with fixed amounts and rate-based amounts. Forms can provide fixed referral amount or base amounts for rate calculations. Multi-currency systems are supported by our Affiliates plugins and forms can provide a choice of currencies or fixed currencies. Notifications with Affiliates Pro or Affiliates Enterprise allow to inform the site administrator and affiliates about submitted forms. Upon each form submission, the system can send notification emails to the site admin as well as to the referring affiliate. 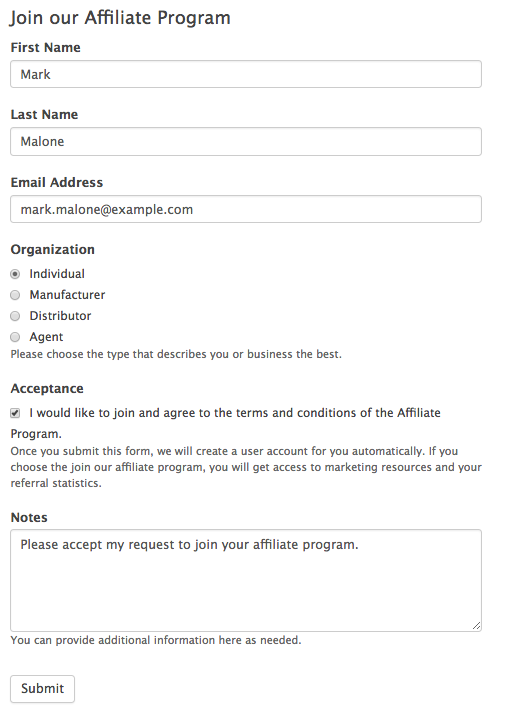 Affiliate notification emails for affiliates are customizable and can include information provided in submitted forms. The form field keys can be used as tokens in notifications where the field key token is replaced by the submitted form field’s data. Sales leads who submit a form managed through this tool for Formidable Forms and Formidable Pro can be tracked down to the referring affiliate, so that commissions for offline or online sales can be credited to the affiliate. If desired, commissions that are determined upon form submission will appear as referral amounts along with each referral. Sales and support teams can use any of our Affiliates plugins for Formidable Forms and Formidable Pro to delegate sales and support requests to the right team members. 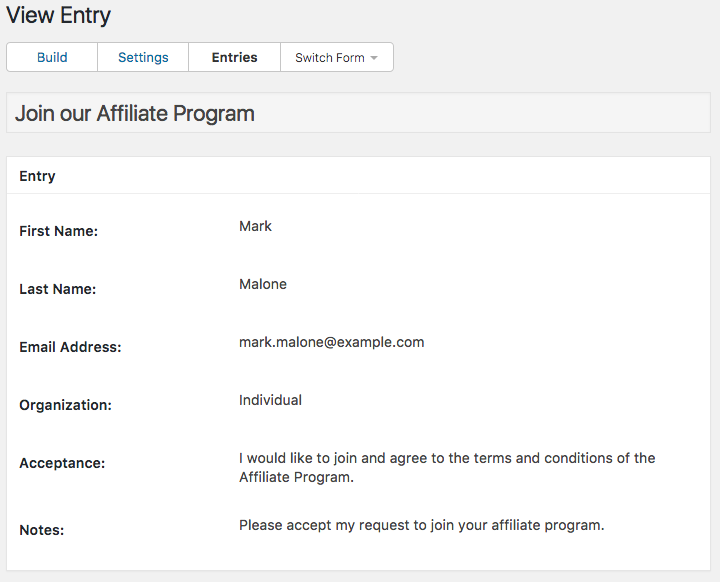 Create an affiliate account for each team member and use affiliate links to direct requests to each. Good to hear from you and thank you for the kind words. Happy new year to you and the Itthinx team as well! In the follow up I posted, the code to register the affiliate did save the username too, so it seems I figured it out. I also thought twice about what I was doing and since we review the application to the affiliate program before accepting new affiliates I don’t really have to register the affiliates straight away when they submit the form. That was a very interesting exercise nonetheless! If it hasn’t been suggested in the past, I think it would be a great feature if there was an additional layer to the Affiliates registration that handles a pending approval process. We’ve pretty much set up everything with Formidable so the notification part is fine but we have to register affiliates by hand, which is ok if we have a few dozens application but could be pretty tedious if there are hundreds. Thank you very much for posting the update on that, you spared me a good amount of time trying to figure out what could have been wrong 🙂 In any case, if you need further help with the process, just let me know and I’ll be happy to review it again. Regarding your suggestion to introduce an approval process, I certainly agree that we need to add this possibility to the registration process. Adding an optional activation step with notification to the site admin would be appropriate and we should have this added. We’re trying to use Formidable to replace the registration form provided by Affiliates. It seems I’m able to trigger referrals with the integration, but I’ve been struggling to actually add a new user as an affiliate using Formidable. Is that possible at all? Would it be possible to use a Formidable form to register affiliates as pending for our team to review submissions? I’ve started to put together a custom function, I’ve looked the documentation for the the functions create_affiliate and store_affiliate, however I’m a real noob in PHP and I’m still not too sure how to use a function from another plugin in my custom functions. If you could give me a hand that would be awesome! Obviously this doesn’t work, it seems to return straight away as if the store_affiliate function wouldn’t exist. Is it because it’s a public STATIC function? The integration with Formidable doesn’t support that, would using Gravity Forms be an option for you? That integration does support the registration. Another option would be to enhance the Formidable integration but I can’t promise when that will be added yet (it’s a good idea anyhow). We’d definitely appreciate if it could make it in future releases of the integration with Formidable because we’re already using quite a bit of forms set up with Formidable so using Gravity isn’t really an option (on top of the price tag). I’ve been able to create new affiliates with the code snippet you provided, thank you for that! I have a question for you though, doing my tests I was able to add myself as an affiliate 7 times so it appears as if there’s 7 person in my team, but it’s only me. I was under the impression the “store_affiliate()” function would test for duplicate and exit if the entry already exist but looking inside the function this test isn’t here. Is there a reason why you would advise against testing if the entry already exist? If I would like to make sure to avoid this scenario, how exactly should I add the affiliate? This way you would only get one registration entry per existing email and as these are unique per user account, you wouldn’t have duplicate entries created. Let me take this occasion to wish you a happy new year! I also noticed that when you register a new affiliate with this method it seems that the username is not registered, is this normal? I took a look at the function on GitHub but I don’t see anything that would register the username indeed so, how important is it to have the appropriate username tied to each affiliate? We make it mandatory for users to log in before being able to apply for our affiliate program. If it’s important how would I go about adding this information when running the store_affiliate function? That’s great (I see you have posted a follow-up, will get to it in a minute). But still, the username is left in the dust. I also noticed that the first name and last name are not tied to the new affiliate. 1. Visitor comes to site via affiliate link. 2. Visitor fills out a form to register to the site (free member). 2a. Affiliate is notified with lead information from form to follow-up. 3. Visitor later fills out a different form to upgrade membership. 3a. Affiliate is notified again with this form’s information. There are no commissions paid for any part of this process. The affiliates are using my website as a resource to educate their contacts. I want them to know that they can still maintain their contact’s information and track them as a lead through the process to member and so-on. Can Affiliates Pro also let my affiliates update information about their leads from the info submitted via the form? Thank you in advance for any direction you can provide! please have a look to affiliates_affiliate_stats shortcode. I cannot download the Formidable plugin even though I have bought and installed the Affiliates pro version. Any tip what I might do wrong here? Please direct support requests for Affiliates Pro to the forum and provide details of your setup there where we will be happy to help you.